The USS DIXIE (AD-14), a Dixie class destroyer tender, was commissioned on 25 APR 1940. 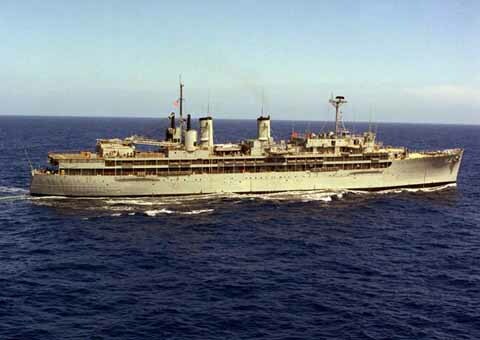 USS DIXIE served her country for 42 years, 1 month and 21 days, until decommissioned on 15 JUN 1982. In the ship yard undergoing maintenance when WW II started, DIXIE advanced westward across the Pacific as the United States fought the Japanese. At war's end she served on occupation duty in the Far East and then at the Atomic Testing at Bikini Atoll. DIXIE spent her career in the Pacific. She deployed numerous times to the Western Pacific, at times in support of the US efforts in Korea and Viet Nam. In the late seventies and early eighties she supported the Fleet in the Indian Ocean during the Iranian Hostage Crisis and the continuing U.S. Naval presence that followed. The second Dixie (AD-14) was launched 27 May 1939 by New York Shipbuilding Corp., Camden, N.J.; sponsored by Mrs. A. C. Pickens, and commissioned 25 April 1940, Lieutenant Commander G. H. Bahm in command. Dixie sailed from Norfolk 20 June 1940 for Pearl Harbor to serve the destroyers of the Battle Force until October when she cleared for the west coast and similar operations at San Diego. When the Japanese attacked Pearl Harbor 7 December 1941, she was undergoing overhaul at Mare Island Navy Yard, and quickly took up the task of readying ships for war service. In March1942 she returned to Pearl Harbor to tend destroyers and other ships of the Fleet until November. Dixie alternated between Noumea and Espiritu Santo in support of the operations in the Solomons from November 1942 to March 1944, then went to the Solomons where she was based at Hathorn Sound. In September she arrived at the huge fleet base at Ulithi serving there until February 1945. Her essential services were next given at San Pedro Bay, Leyte, where Dixie remained until the end of the war. She served ships on occupation duty at Okinawa and Shanghai, then returned to the west coast in December 1946. In the summer of 1946 Dixie sailed to Bikini Atoll for atomic weapons experiments, Operation "Crossroads." In 1947 and in 1949 she cruised to the Far East and based on Tsingtao to serve destroyers on patrol off the Chinese coast. When the Communist advance forced the evacuation of Americans from China, she acted as headquarters for the American Consul and Charge d'affaires at Hong Kong. She continued her active service alternating flagship duty for Commander, Cruiser Destroyer Force, Pacific Fleet, at San Diego, with tours in the Far East, based on Sasebo, Japan or Subic Bay, Philippine Islands. During two of these western Pacific tours, she rendered valuable assistance to the ships of the United Nations operating off Korea. In 1959 and again in 1960, in addition to serving at San Diego, she sailed to the Far East to provide tender facilities for the 7th Fleet. Dixie received five battle stars for Korean War service.